Duck fans, I’m certain you were all as excited as I was when OSU took down Alabama in the Sugar Bowl. I mean, just the prospect of playing a third-string QB in a National Championship game is enough for some to already start ordering Ducks Championship T-shirts. But for now, we need to pump the brakes. Although yes, the Ducks are favored and should be favored, here are three reasons the Ducks can’t get ahead of themselves heading into this final matchup. The Buckeyes’ coach, friend and admirer of Chip Kelly, has solidified his place among the college football greats. Not only was he able to build a legacy down at Florida, but now he’s done it again at OSU. He came into a program that was being hit hard by sanctions, and instead of just giving up on the guys and saying, “Hey, we can win in a few years,” he led his team to an undefeated season and since then he has totaled a 37-3 record in three years at OSU. His ability to develop players, QBs especially, has not only salvaged OSU’s season but completely turned it around. I mean, come on! A third string QB went into his first start, a B1G title game, and came out and won 59-0. 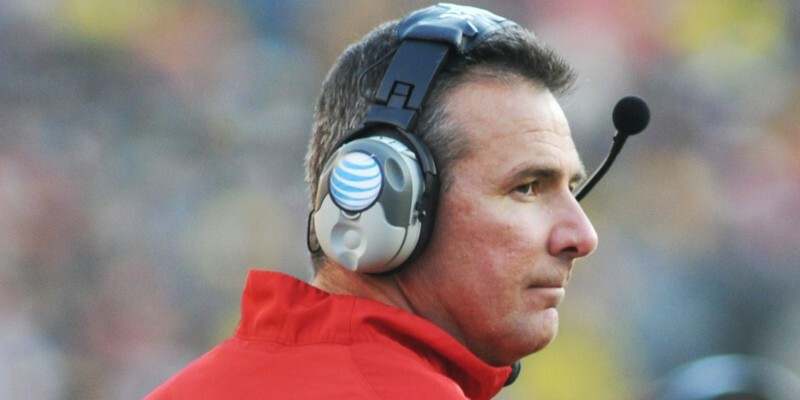 Urban Meyer is a force to be reckoned with, no matter how scared he might be of us. Ezekiel Elliott and Cardale Jones, although unlikely candidates, are two very good players leading a very good offense. Elliott is a sophomore who has experience in big games, and it showed against Alabama when he broke off the huge run that clinched the game for the Buckeyes. He’s a powerful downhill runner not unlike his predecessor Carlos Hyde, but he also has incredible speed for his size. On the flip side, although Jones is young and certainly inexperienced, the third-stringer has a cannon for an arm and OSU has one of the best deep threat receivers in the nation, Devin Smith. OSU certainly isn’t going to hold anything back, so I wouldn’t be surprised if Jones takes deep shots early and often. Joey Bosa leads a dominant OSU pass rush, something that has given the Ducks trouble this year. With Hroniss Grasu returning to full health the Ducks should be better on this front, but still the offensive line is certainly the weak spot for our offense. If Marcus Mariota has time we all know what he can do, and OSU will all but certainly lose. But if Bosa and his pals can force pressure and kill drives with sacks, this game turns into a whole different story. The key for Bosa and the rest of the D-line, though, will be to stick in their rushing lanes. A killer for teams that have lost against us is getting out of their rushing lanes and having Mariota gash them for big runs once he escapes the pocket. So although yes, I still think the Ducks will win, there is no reason for any Duck fan to go into this game with a ton of confidence. No matter the situation at OSU, Urban Meyer will prepare one heck of a game plan and get his guys as prepared as they can be. I know I’m looking forward to it, and hopefully a Ducks win. Go Ducks!